After complaints from Keith Barrow and the threat of legal action, this blog post has been modified. I have changed the strap line to the “Barrow Era” not the “Barrow Affair”, removing any suggestion that he was responsible for decisions on TNS matters when he was leader of Shropshire Council. I have also corrected an error that said that Keith Barrow was chair of the Joint Economic Board. He was deputy chair and only chaired on one occasion. Yesterday reports into yet another scandal from the Keith Barrow era at Shropshire Council were released. The auditors’ reports soft pedal on criticism and fail to answer key questions. The focus is entirely on the administrative processes. Yet the main failure was in political leadership not in administration. This was a £3.5million Shropshire Council programme. Just £80k went to TNS. I have heard no complaints about any other funding under this programme. But TNS is based in Oswestry, it is Keith Barrow’s favourite football team, and the grant – which is claimed to have been a loan – was awarded in unusual circumstances. TNS denies any wrongdoing and yesterday its owner demanded an apology from the council. The audit report sheds some light on this murky affair. This is a tale of a badly run council, where “inadvertent” errors deleted vital records, when they were kept. The auditors say “it is unclear…” no less than 22 times. Redacted audit report. Redacted addendum to report. Action plan. Shropshire Council press release. The release of the redacted reports to the media follows persistent pressure from BBC Radio Shropshire to expose the TNS scandal. It has taken dogged work by private investigator Paul Wiseman to get this scandal exposed at all. Now we can understand much of the story but crucial questions remain unanswered. The scandal concerns a grant of £80,000 to Keith Barrow’s local football club, TNS. The grant was made at the behest of the now defunct Oswestry Economic Board to build a new stand. It not clear from the auditors’ report why a loan was requested. My guess is that the payment did not meet the criteria for the Market Towns Revitalisation Programme and that was why the pseudo-loan was made. But this is only a guess as the auditors’ report doesn’t cover this issue. The two reports were initially sent to local media, not councillors. My complaint about that has been accepted by the council. All names in the reports have been redacted. We councillors are accountable for public money. Yet there is only one mention of councillors in this report. And then their names are redacted. This is unacceptable. It is perhaps appropriate that the officers involved are not named, as they may have come under considerable pressure from the former council leaders. But the councillors involved must be named. Only when that is revealed, will we be able to see how this scandal links with others, including Shropshire Council’s failed company ip&e. Some of the councillors may still be in important positions in Shropshire Council. (a) Provide additional employment for six full time staff within the first 12 months. The auditors conclude there is no evidence that this objective was delivered. (b) Deliver a minimum of twenty additional events within the first 12 months. The auditors conclude there is no evidence that this objective was delivered. (c) Deliver 20,000 additional visitors to the town within the first 12 months. The auditors conclude there is no evidence that this objective was delivered. (d) Deliver grants of £16,000 per annum for a period of 5 years for purposes to be agreed by the Oswestry Economic Board. The auditors conclude this objective was not delivered. There is no evidence to demonstrate delivery of outcomes (a) to (c) because Shropshire Council does not have a project closure report. But officers claim “these outcomes were a natural result” of building the football stand. The auditors say the absence of a report “represents a risk”. That’s a coy way of saying that there is no evidence that this grant achieved value for public money. The auditors’ report concentrates on that last objective. Was the money paid back? The short answer is no. Only £10,000 was paid back. That’s not even one year’s worth of the planned repayments. It took more than a year after the £10,000 was invoiced for full repayment to be made. Why only £10,000? TNS owed the council £32,000 at this point. The auditors say that “it is unclear why the full £32,000 due at this time was not invoiced for.” Not many things about this affair are clear. I have been in public service or working around the public sector all my life. I have never seen such a curious and improper mechanism for giving a loan to a club. It was given as a grant to be repaid to Shropshire Council who would then pass the money to Oswestry Town Council. The town council was to spend it according to priorities dictated by the Oswestry Economic Board. The board was chaired by Shropshire Council leader Keith Barrow and included town councillors. It met on a “regular basis” until July 2013. The auditors say: “It is unclear why the Board went dormant at this stage.” If any minutes of the board exist, they are not public. The Oswestry Economic Board “went dormant” on Keith Barrow’s watch. But he was not interviewed as part of this investigation. Neither were key officers who have since left the council. That error was to say the least unfortunate. It seems typical of a period when political leadership dominated best practice in use of public funds in Shropshire Council. It was after all the era of ip&e – the opaque council owned company that ultimately led to Keith Barrow’s resignation from the council. There has been no examination of whether the “grant” should have been awarded in the first place. Or of why a loan as disguised as a grant. Or whether that was legal. 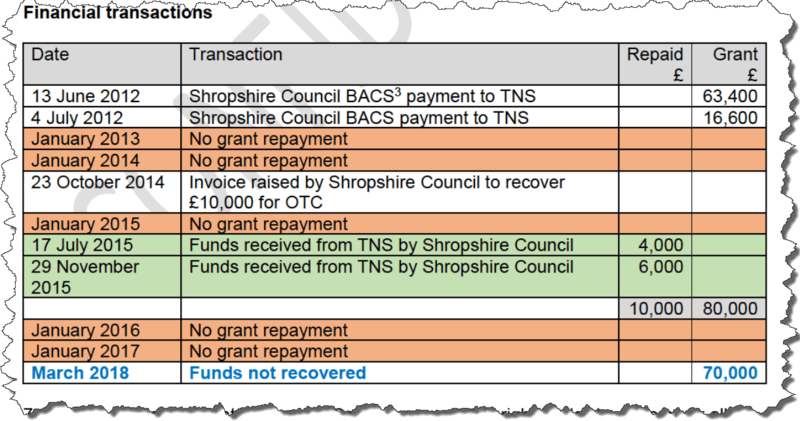 An email from Shropshire Council in May 2012 showed that Shropshire Council was desperate to find a way to get this payment to TNS approved by whatever means. This was a political issue and the auditors’ reports have nothing to uncover that. It was a failure of leadership. It was a breach of public trust where funds were steered to a favoured project of the then council leader. Shropshire Council officers felt obliged to make that happen. Accountability rules have been tightened a result of the TNS affair. That is welcome. But the scandal of Keith Barrow’s rule of Shropshire Council is not yet fully uncovered. I have a duty, along with all councillors, to ensure that public money is spent with probity. What worries me is that councillors involved in the TNS affair may still be serving. That is why they must be named. If the auditors won’t name them, they should come forward and make themselves known.
. A loan would certainly have been illegal under state aid rules.
. Unless of course, Shropshire Council is planning legal action against these councillors but there is no hint of that happening.
. The £10,000 repaid was used to fund a young entrepreneurs club in Oswestry. A worthy cause. If the auditors “won’t name them”, under which of those three responsibilities do they refuse to do so, and under what authority?